The paintings of Raphael Soyer belong to the context of the social realism which emerged in the United States inspired by the movements that had arisen in Mexico following the Revolution of 1910. Soyer, who was of Russian origin, emigrated to America in 1913. Both he and his twin brother Moses and their youngest sibling Isaac took up painting. The lives of Raphael and his brothers were closely connected and they worked on many projects together. He studied at the Cooper Union, the National Academy of Design and the Educational Alliance Art School until 1922. His first one-man exhibition at the Daniel Gallery in New York in 1929 was such a success that thereafter Soyer devoted much of his time to painting. Despite this, between 1933 and 1942, he taught intermittently at the Art Students League. Soyer espoused figuration from the beginning of his career. The main subject of his paintings, executed in a direct style, was always New York City. His first urban landscapes gave way to portraits of the working class. During the 1920s, along with his brothers, he became an important member of the Fourteenth Street School, an association of artists interested in showing social inequalities. At the same time he worked with his brother Moses in the Works Progress Administration. The economic crisis that gripped the United States in 1929 merely accentuated this tendency and his paintings, watercolours, lithographs and book illustrations depicted jobless people and social outcasts. Raphael Soyer had a lifelong interest in the genre of portraiture. He painted his family and friends of the New York art scene, sometimes singly and sometimes in groups. 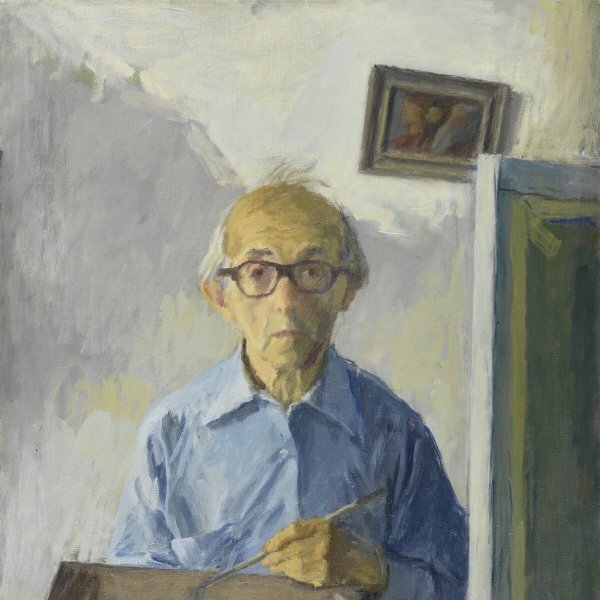 He himself was the subject of many paintings and there are more than fifty surviving self-portraits.